Made in Japan, a large 16 oz package that comes in elegant packaging -- you get five separate bundles wrapped with a small black cloth band. There's a recipe on the package for stir-fry noodles. As shown below, we boiled one bundle for a few minutes then rinsed in cold water and set aside. Separately, mix together sliced uncooked shrimp, sliced pork, and sliced green onion. Season that mix with salt, pepper, and a bit of hontsuyu. Now stir-fry that meat mixture in a bit of oil, until cooked. Add cooked somen into the frying pan, followed by sliced yellow onion and a few tablespoons of hontsuyu. Stir-fry until thoroughly mixed. Then serve with a bit of sliced fresh red chilli peppers, green onion, fresh bean sprouts (optional) and fresh lime wedge. These thin white noodles made from wheat flour are perfect for making Khanom Jin, the classic Thai dish of noodles topped with a colorful fish curry and an abundance of fresh green vegetables. Also see them pounded up in a jungle salad, Thai style. 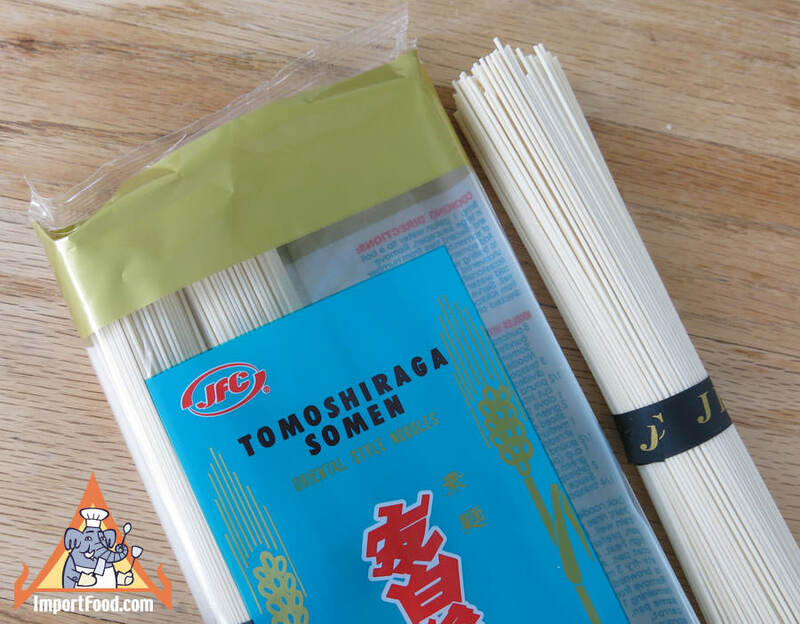 These are top quality noodles, each 16 oz pack contains 5 neat bundles. Ingredients: Wheat flour, salt, water. No additives. Product of Japan. We also offer Japanese Udon and Soba noodles.